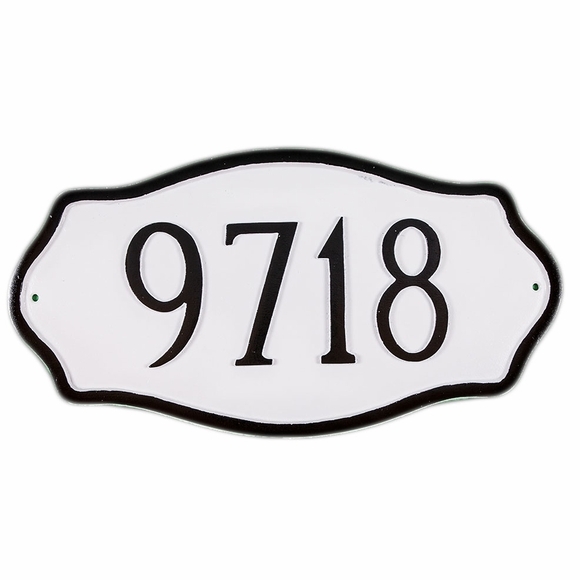 Personalized Estate Size House Number Sign - - 24" x 12.5" personalized plaque can hold four 6" numbers. Choose one or two lines of personalization. Made in USA. Features large clear numbers on a clean uncluttered background. The trim border accents the unique shape, which is somewhat rectangular with a softer ovalish attitude. Personalized with your address and color selection. Two lines with up to five 4" characters on line 1 and up to 17 characters on optional line 2. If you are ordering a 1 line sign, please leave the optional Line 2 input box blank. Wall mount or lawn placement options. Available with or without two optional 24" lawn stakes. three premium combinations - - aged bronze/gold, swedish iron/silver, and swedish iron/black. Dimensions: 26.67"W x 16"H .
Solid cast aluminum construction. Characters and border are part of the sign, not added on. Made in the USA.